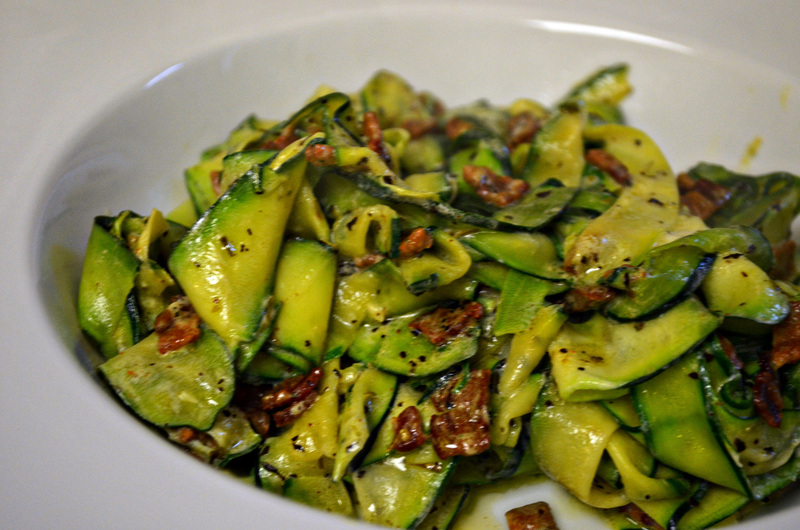 My veggie confession…I’m not a big zucchini eater. Any other kind of squash, I absolutely love. I think…maybe…it has to do with the over-cooked, somewhat soggy and mushy zucchini I tend to remember from my childhood. Something I have loved from childhood is fettucine alfredo…but now, I know that the cream destroys my stomach and the gluten in the pasta does generally not nice things to the rest of me…so it’s not been an option for over a year now. Generally, I’m okay with the things I can’t eat anymore and have embraced the ones I can. But once in a while, there’s a craving I just have to figure out a way around. Last week, something creamy…saucy…noodle-y was it. I put this together Friday night, and then served it again Saturday to guests who loved it as much as we did. I probably would have made it Sunday night again, but my family might have revolted at that point. It’s a great side dish – and I’m always looking for new ways to cook veggies – but add a little grilled chicken, and it’s an easy dinner. Oh…and a quick note on the coconut milk. I don’t notice any residual coconut flavor in the final dish at all – the bacon and spices knock it out completely. In a good sized frying pan, cook the diced bacon on medium until the fat has rendered and the bacon is crispy. While the bacon is cooking, peel the zucchini into strips longwise using a vegetable peeler, leaving the seed core for the compost bin or garbage disposal and turning the zucchini as the ribbons become too wide. Once the bacon is cooked, remove about half of the rendered fat, turn the burner just a little bit higher and add in the zucchini noodles. Cook, tossing often, for a few minutes – you don’t want the zucchini to get mushy, just cooked enough that you can swirl it around a fork without breaking. Taste and adjust seasonings with sea salt and fresh cracked pepper. If you’re okay with dairy, I think a little sprinkle of parmesean would be great – but it’s not needed. I’m sure this will be on my menu all summer when I have zucchini being left on my doorstep by our garden crazy church members! This sounds fun. I’ve done carrot parpadelle before as a “pasta” dish. It worked out great. I’d imagine its lovely with zucchini which I really enjoy. It’s good to know that I can knock out the coconut flavor with bacon. Great tip! I found you through Slightly Indulgent Tuesdays. I host Whole Food Wednesdays at beyondthepeel.net. I’d love it if you dropped by for a visit. This is exactly the types of recipes we’re looking for. Thanks and have a great rest of your week. I’ll definitely drop by! Thanks for inviting me. I made this last night and it was delicious. Thanks for the recipe. Simply wonderful ….. thank you so much! I was looking up “paleo zucchini” in a google search as that was a main ingredient I had in the fridge that I wanted to use up. Your recipe was the first I noticed (about 3 from the top) and the only one I opened! I, unfortunately and unusually, didn’t have any bacon in my fridge or freezer. So I made it with chicken thighs! Super, super yummy! I can’t wait to try it with bacon. Oh and even with chicken I didn’t get a residual coconut taste either.